"What's all this about a police box on the runway?" A moment please for the last regular use of the original Doctor Who theme music. A tweaked version makes it's debut next episode. The Tardis lands on the runway at Gatwick airport. Discovered by the police, the time travellers scatter with Jamie remaining with the Doctor while Ben and Polly are each left by themselves. The airport Commandant orders the Police Box removed. Polly hides in a storage area, belonging to Chameleon Tours, where she witnesses a man in a suit being shot by a futuristic gun held by a man wearing an airline pilot's uniform. She finds Jamie & the Doctor on the runway and tells them what happened. They return to the store room where the Doctor notices that the body has been electrocuted and is concerned by the gun. However they are being observed by Captain Blade and Pilot Spencer, the murderer. The travellers leave to inform the authorities but Polly lags behind and is kidnapped by Spencer. The Doctor & Jamie can't get past immigration control where the man in charge, Jenkins, informs the Commandant about his suspicious visitors. Spencer tells Blade that Polly has been processed and will be on the next flight. The Doctor convinces him to visit the storage area but no body can be found. 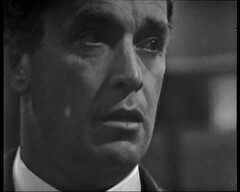 The Doctor tries to interest the Commandant in the unused foreign stamp found in the body's pocket and the burn marks but he has them taken back to immigration. The Doctor and Jamie spot Polly in immigration but she denies knowing them. 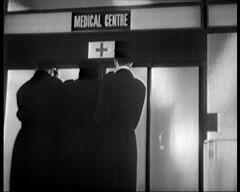 Blade and Spencer lead a disguised figure from the hanger to the airport's medical unit. What little we can see of the figure looks hideously burned and misshapen. Oooh, a mystery episode. Sometimes it's clear from the go what's going off but all we know from this episode is that someone's been murdered in the Chameleon tours hanger, Polly can't recognise her friends after a visit to Chameleon tours and the staff at Chameleon tours are helping some strange being. So I think we'll note that the Chameleon tours place might be a bit dodgy! Polly gets a bit to do this episode, but Ben all but vanishes after the first few minutes, popping up to look in the door of Chameleon tours then leave again. However this episode effectively marks the start of the great Doctor/Jamie partnership with Jamie innocently putting his foot in it and the Doctor trying to cover up after him. It's probably the first episode he gets anything real to do after his debut (with the exception of the "Piper" stuff in Moonbase) and he's superb with the Doctor here. The major filming location for this story is Gatwick Airport. 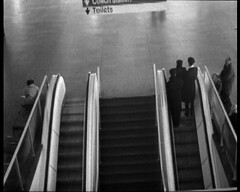 The intention had been to film at Heathrow, the then only designated London Airport, but they refused but Gatwick was happy to accommodate the Doctor Who team. Doctor Who would finally visit Heathrow (and use Concorde) 15 years later in Timeflight. 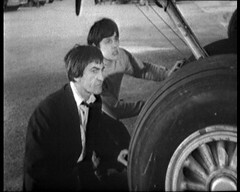 The outside of the airport and it's hangers is heavily featured at the start of this episode as the Doctor and friends shelter and then at the end we see some of the interior as the disfigured body is led through it. 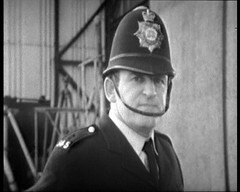 This episode is the only one that features Peter Whitaker as the already deceased Inspector Gascoigne. It's his first Doctor Who appearance, and his only credited one! He'll return as the Weather Station Worker in The Seeds of Death episode five, a Thal Politician in Genesis of the Daleks, a Mentiad in The Pirate Planet, a Grecian Man in Four to Doomsday and an Onlooker in Remembrance of the Daleks part one. He was a scientist in the Blake's 7 episode Project Avalon and appeared in two Doomwatch episodes playing a Ministry Inspector in Train and De-Train, which survives, and a man in Flood, which sadly doesn't. 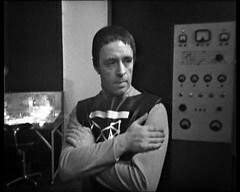 James Appleby, the Policeman who sees The Tardis crew arrive, has been in Doctor Who before, appearing as a Guard in The Massacre 4: Bell of Doom. He'll be back in - The Masque of Mandragora: Part Two as another Guard. The easiest place to spot him is probably Fawlty Towers: The Builders where he plays Stubbs. Playing the Chameleon is Roy Pearce who was also in The Massacre 4: Bell of Doom as a Guard before appearing as a Soldier in Snow Camouflage / Engineer #2 in The Tenth Planet episode 3. He'll go on to play the Cyberman in The War Games episode ten, an uncredited extra in Doctor Who and the Silurians episode 6, a Villager in The Dæmons, a Solos Guard in The Mutants, an Exxilon in Death to the Daleks and a Courtier/Brother in The Masque of Mandragora. Since then he's been in Blake's 7 as an Armed Crewman in Space Fall, a Federation Trooper in Time Squad and a Scientist in Project Avalon. 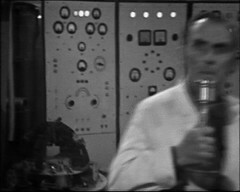 He also appears in Doomwatch as a man in Invasion and Flood. 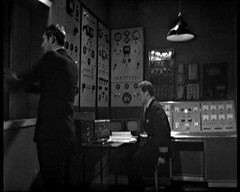 This episode sees another appearance by the panels first seen in Doctor Who in Dalek Masterplan 5: Counterplot. We've seen them since in The War Machines and the Underwater Menace. 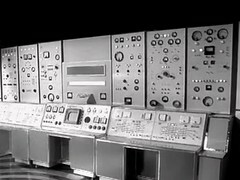 The panel on the left was in Dalek Masterplan 5. The one next to that we saw in the War Games. 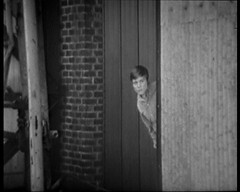 Next to that are two we've not seen in Doctor Who before but the one on the right was in The Avengers episode The House That Jack Built where six of the panels can be seen together. This episode always resided in the BBC Film & Video archive, but a cut copy also exists in Australia (around the death of the man at the start) which lead to rumours that the BBC's copy was cut: It isn't. Faceless Ones 1 was one of the last episodes to be released on VHS in the Reign of Terror boxset along with the surviving episodes of that story, episode 3 of this one and The Web of Fear 1. Released on the 24 Nov 2003, the closest Monday to the show's 30th anniversary (Videos & DVDs are nearly always released on a Monday) this set was *VERY* poorly distributed and is the only release during the Internet stores age that I've had to buy in store (HMV Richmond) after Blackstar completely failed to send my preordered copy! A year later all three Troughton episodes were re-released on DVD in the Doctor Who - Lost In Time DVD set.